Scallops are one of my favourite ingredients to cook with. They seem so elegant, but you would never guess that they are so easy and simple to cook. You could easily serve this spinach and scallops dish to company, or, serve it as a regular weeknight meal. The best part about this dish is not only is it healthy, and made with very few ingredients, but it comes together in less than 10 minutes. Did you hear that? 10 minutes. I think that this is the perfect dinner for those summer nights when you’re all grilled out. I don’t know about all of you, but after countless dinners of hot dogs, hamburgers, chicken and sausages, I’m in the mood for something a little fancier – and something green. The scallops only take a few minutes to sear and the spinach takes mere seconds to wilt in the hot pan. Since this dish has very little hands on time, it means you won’t be slaving over a hot stove during these scorching summer months. Using kitchen shears, slice scallops in half horizontally. Heat oil over high heat, and just before it smokes add scallops in one layer, you will have to cook scallops in 2 batches. Starting from the outside and circling in to the center. Cook for 2 minutes on the first side, and using tongs, flip scallops over and cook for another 2-3 minutes. Scallops should have a nice sear on both sides. If not, flip again and cook for another minute before removing from skillet. Once all the scallops are cooked, there will be a nice layer of dark flavor at the bottom of the pan. Add in 2 tbsp of butter and the white wine to de-glaze the pan. Using a wooden spoon, scrape all the flavorful bits from the bottom. Add in the remaining butter, and parsley, season with salt and pepper. Place the spinach in the pan and cook for a minute, allowing to wilt. Turning with tongs to coat in the sauce. 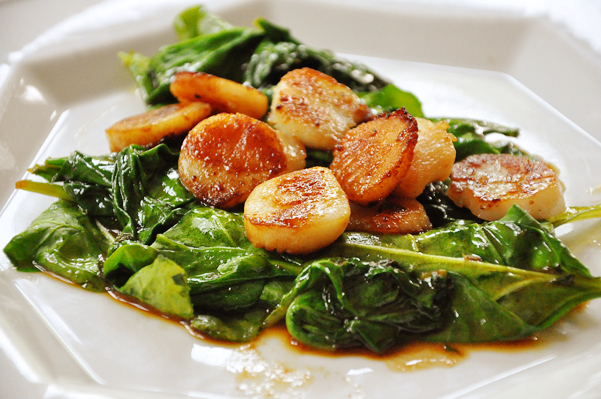 Serve scallops on top of wilted spinach, pour any extra sauce over the scallops. Well, that’s one of my favourite, simple, summer dinners. Anyone else not in the mood for burgers tonight? Who doesn't love a seared scallop! YUM! Happy New Year! Couldn't agree more Josh! Happy New Year!